There are some professions in the world where you can expect to take some licks. Your body will be on the receiving side of some hard-core contact. The men and women in uniforms (specifically police or law enforcement “The LEOs”) have one of the toughest jobs in the world. The criminals and murderers hardly ever go into their custody without a good amount of struggle from their side and of course, these men and women are in complete contact occupation. Keeping in mind their job and what they do, we have listed the best watches for law enforcement or police officers. Being in the line of duty for most of your life comes with the fair share of havoc not just to the body, but also to the wristwatch. And your normal, classy elegant timepiece will be nothing but just a piece of the wristband on your hand since these watches can’t handle the pressure and the shock of the job. All those knocks and blows will just wreck your overpriced watch. Why do Law Enforcement “LEOs” Need Watch? This might seem minor to us but a tool like a reliable timepiece is very necessary when you are on the watch 24/7. You can’t rely on your mobile phone every time when you are on the go or chasing a criminal. So, we have been doing our research and found some of the best watches for Police officers. Law enforcement officers are always on the hunt on the kind of timepiece that can take a beating as well as they can. It can be very challenging to choose a watch from the market where there is a wide variety of tactical watches readily available. The confusion can take a peak with all the options around. To help you out here are some of the best watches for law enforcement or police officers. The Rangeman tactical watches are a series of hard-core G Shock watches which seem to be manufactured solely for police officers and anyone with this rough routine. 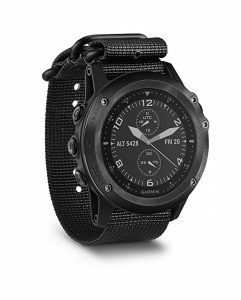 The incredibly rugged watches have not been only wowing police officers but also hunters, hikers, mountain climbers and many more. 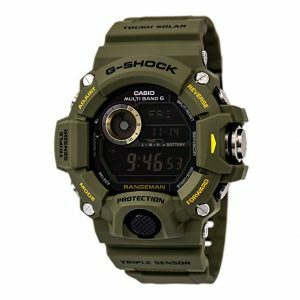 This Rangeman series has all the qualities of Casio’s G Shock with increased durability. These are entirely made to serve the needs of Police officers, from an amazing shock resistance to with its spot-on button placement and easy and common sense navigation, this watch is impressing the occupation. The Rangeman’s “Tripe Sensor” feature activates by which you have pressure, temperature and altitude information ready to be displayed. You can sense the rain is coming earlier with the barometric sensor included on the watch. Moreover, it is an atomic watch which means it will keep its time accurate thanks to the receptive antenna that syncs time with your location. Another cool thing is its solar recharging. Not only you are mentally free for the rough job requirement but this job is also taking care of its battery by self-charging. If you live in a place where it is cloudy or winter is too long then don’t worry you can even charge this beast with artificial lights. Considering that it is half the price of other watches of this series, this watch will be our go-to until something bigger than this comes to beat it. There is no comparison of Casio G Shock series tough nature. They can last for decades and for a law enforcement officer this is a big plus point. 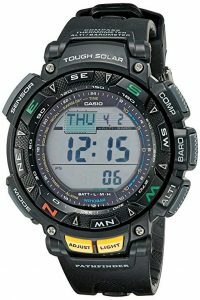 Casio Pro Trek series smartwatches are designed for the sports enthusiast, law enforcement and anyone who has a tough routine of work. These timepieces are equipped with a number of advanced features that are perfect for outdoor adventures. The design of the pro trek series is top notch. Unlike G Shock it does not like very heavy on the wrist. The subtle bezel, digital display, smooth band with loads of features, makes it a must include into our list of best watches for police officers. Being highly shock resistant isn’t the only quality it has. In addition, to the fact that it can take a solid amount of beating and not have a scratch, you can take it out on a swim and nothing will happen to it. Yes, of course, it’s water resistant as well. The watch’s polyurethane band is its best quality. Not only it is comfortable, but also it is very easy to clean, be it sweat, mud or anything thrown on it. 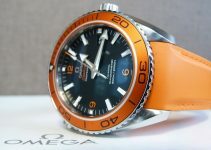 They offer rugged, stylish timepieces with features that enhance your outdoor experiences. However, if you are not a fan of smartwatches and need a tough armor on your wrist than G shock should be your choice. We all know Casio is one of the earliest companies to be manufactured. It comes with a variety of designs from the most simple, elegant and sleek designs which are just perfect for a date night out to the most rugged, yet most stylish watches. The coolest thing about Pathfinder is that it’s solar powered. It has enough energy absorbing power that it can go 6 months without seeing a hint of light. Since we want a watch for law enforcement, it comes with a compass that keeps you on your track. It has five alarms and a feature that measures altitude as well. This watch is relatively easy to use which is now considered in one of the most popular and best watches for Law enforcement. in comparison with the g shocks 200m water resistance, Pathfinder only has the 100m water resistance. After all, this is a mid-range watch series by Casio. It also lacks the atomic time syncing feature, not something to drool on but certainly, a feature that is quite handy, especially because there are a lot reports for a law enforcement officers and timekeeping is an essential part of it. The entry of this incredibly inexpensive, durable watch into the market in the field of tactical watches has caught us off guard. The watches are designed solely for this purpose with a soft strap instead of a stainless-steel band that breaks as soon as it is hit by something. The Timex Expedition watches have exceeded our expectation in design and features and delivered a tough, useful timepiece which can be worn all day while on duty and off duty. The general leather strap won’t wear off either. Not is it only shock resistant according to the I.S.O standard but also water resistant down to 100 meters. You could pay 10 times more for a slightly better watch, but ask yourself if you even need to when this bad boy is in the market? We would place it as an inferior option to Casio Rangeman considering the criteria for best watches for police officers. This watch is between a cross between expensive Rolex and a high-performance dive watch. Garmin has not disappointed us with its Tactic Bravo Tactical Watch ready for an on-duty operation after a criminal. 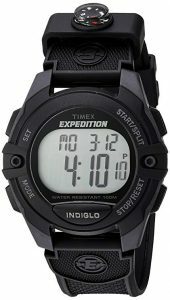 The watch is loaded with tons of advanced features including the sunlight readable display, night visibility, and an Omni-direction EXO antenna. It’s not just a watch but it allows you to download software updates. No doubt this Garmin Tactic Bravo Watch is exactly what you need to spend your time within the line of duty. Yes, it is expensive but what makes it cool is the EXO antenna which grabs the coordinates through satellites and can help LEOs navigate in tough and challenging missions. Also, the dark profile will help the officers stay un-noticed. The diamond-like carbon coating is another factor that will offer scratch resistance. 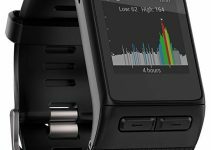 If you don’t have a budget limit and would like to have great features that would help you track your day then Garmin Tacitx is the ideal choice for you. 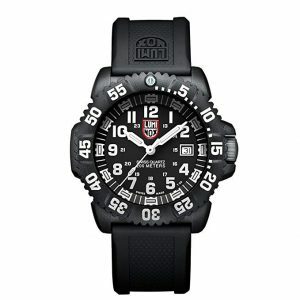 The Luminox Evo Navy Seal Tactical watch is a joy to behold and not only a blessing to the eyes. The versatility, durability, ruggedness, and usability are just some of the features which got us going crazy over the watch. Luminox Evo Navy Seal might be the most comfortable watch out there in the market right now with a durable rubber band. The band, as well as the rest of the watch, is stylish and comfortable. The watch face displays a clear dial that is easily readable not only in bright sunlight but also illuminates at night. Why wait and scroll over for other watches when the watch you need is right in front of you? The glow of markers under low light makes it a treat to look at the time. Although the band is durable it is susceptible to quick wear and tear and you will have to replace it later. What makes this watch special is its dial luminosity which is claimed to be over 100 times brighter than the other watches in the market. Police officers mostly find themselves in environment rain, darkness, altitude can compromise the working and functionality of basic, standard wristwatch. Because of these reasons, they need something can overcome these problems and are tougher than just your go-to random watch. They basically need a tactical watch. Personally, we don’t think the police officers should spend a fortune on a watch that they would wear every day in the roughest environment possible. So, an affordable, reliable watch will be their first priority but at times the extra feature on the watch can come really handy. The ability to predict an incoming rain or put waypoints or get coordinates from the satellite can only happen if you spend some extra bucks. Yes, the extra money you put in place would be worth the money. The police officers need something that won’t get all scratched up and which is tough enough to stand up to some punishment. We would suggest a buckle over a clasp and a soft strap instead of a stainless-steel strap which will be broken as soon as it’s hit. Casio G Shock Rangeman is best in terms of durability as watch for police officers. They are specially designed to absorb strong impacts. Push button illumination kinds of becoming a necessity when you spend most of the time in the dark. The night light button is especially a blessing for the officers patrolling the nights when they can’t see time in their standard watches. Smart watches are better for night readability, it is sometimes awkward to press a button to light up the watch interior than a capacitive smart touch screen. No compromise for a watch that must be worn all day long. You may consider cheaper watches but the reality is they are not made for comfort but only to tell time. For someone working in law enforcement comfort should not be compromised. That is the key for all tactical watches, they should not be reflective and shiny but rather have a dark build. Imagine on duty in a remote area and your watch has a white band, it would get you detected. Another thing which should be kept in mind when choosing a watch for police officers is that it should be easy to read when glanced at. It either means it should have a dial big enough to read the time easily or the dial should have very clear displays. But then again, everyone has their own preferences. A lot of the officers think life is too short for an ugly watch and they are willing to spend a pretty amount for an everyday watch while the rest of police officers prefer to wear an inexpensive watch on duty and an expensive, elegant watch when they are off duty. 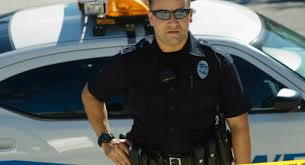 The best watches for law enforcement or police officers, all in all, are the ones which stay comfortably on their wrist all day even when they are out chasing bad boys on the road. It is worth being labeled the best if they can withstand the roughness and risk involved in it and then keep up to date as well. All they need is a timepiece that they can rely on which potentially makes their job safer as well. 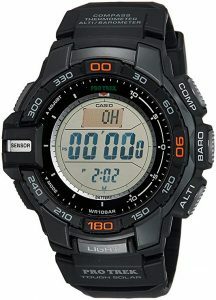 Casio specializes in making rough, tough and long lasting watches specifically their G Shock series. They are the first choice of the special forces as well.